Bottom of the table Blackpool remain 10 points adrift of Championship safety after losing to Sheffield Wednesday's first-half penalty. Chris Maguire's spot-kick six minutes from half-time proved the winner at Hillsborough after Peter Clarke fouled Stevie May. The visitors had chances to earn a point but Ishmael Miller spurned a golden opportunity from close range. The striker was then sent off in injury time for a second yellow card. Sheffield Wednesday had lost their last two league matches but this win leaves them in mid-table, 11 points clear of the bottom three. In contrast, Blackpool are in a perilous position, having won just once in their last 12 league matches, and are adrift at the bottom by seven points. They had their chances with Chris Eagles shooting wide and Nathan Delfouneso having a curling effort saved after Wednesday's opener. The Owls went close to doubling their advantage when Maguire's low cross from the left deflected onto the crossbar, before Miller was booked for turning Tony McMahon's centre into the Wednesday goal with a hand. Home goalkeeper Keiren Westwood brilliantly kept out Miller's three-yard header, before Miller received a second caution for a late tackle on Tom Lees. Sheffield Wednesday boss Stuart Gray: "It just shows with us that we cannot get that second goal to take the pressure off. "Again, we're relying on Keiren Westwood to pull off a fantastic save to give us two points. It was a must-win game and that's all we could do today." 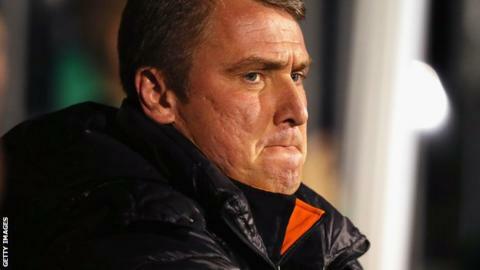 Blackpool manager Lee Clark: "In our predicament, results are the most important thing but our performance and response from last week [a 6-1 home defeat to Bournemouth] was excellent. "I don't think Lady Luck's shining on us at the moment, I think the least we deserved was a point from the game." Match ends, Sheffield Wednesday 1, Blackpool 0. Second Half ends, Sheffield Wednesday 1, Blackpool 0. Second yellow card to Ishmael Miller (Blackpool) for a bad foul. Foul by Ishmael Miller (Blackpool). Jeremy Helan (Sheffield Wednesday) wins a free kick in the attacking half. Corner, Blackpool. Conceded by Chris Maguire. Attempt blocked. Peter Clarke (Blackpool) right footed shot from outside the box is blocked. Assisted by Nathan Delfouneso. Attempt blocked. Atdhe Nuhiu (Sheffield Wednesday) left footed shot from the left side of the box is blocked. Assisted by Chris Maguire. Attempt saved. Jeremy Helan (Sheffield Wednesday) right footed shot from outside the box is saved in the centre of the goal. Assisted by Josè Semedo. Substitution, Sheffield Wednesday. Atdhe Nuhiu replaces Stevie May. Attempt blocked. Stevie May (Sheffield Wednesday) right footed shot from outside the box is blocked. Assisted by Chris Maguire. Substitution, Blackpool. Charles Dunne replaces Darren O'Dea. Offside, Blackpool. Jamie O'Hara tries a through ball, but Ishmael Miller is caught offside. Attempt saved. Ishmael Miller (Blackpool) header from very close range is saved in the bottom left corner. Assisted by Nathan Delfouneso with a cross. Corner, Sheffield Wednesday. Conceded by Joe Lewis. Attempt saved. Stevie May (Sheffield Wednesday) header from the centre of the box is saved in the bottom right corner. Assisted by Royston Drenthe with a cross. Foul by Chris Eagles (Blackpool). Foul by Jacob Mellis (Blackpool). Offside, Blackpool. Ishmael Miller tries a through ball, but Nathan Delfouneso is caught offside.